M.I. 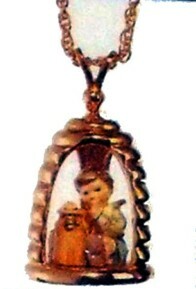 Hummel Olszewski Miniature Honey Lover Club Pendant was first introduced in 1994 for members of the M.I. Hummel Club to renew membership in the 1994/95 Club year. It bears the inscription “EXCLUSIVE EDITION, 1994-95, M. I. HUMMEL CLUB, and carries the mark of 247-P. This Honey Lover figurine is an interpretation in miniature of the M. I. Hummel figurine large porcelain HUM312 and was re-carved and painted by Master Artist Robert Olszewski at the Goebel Miniatures Studios in Camarillo, California. The painted bronze figurine is ½” tall. The pendant and the 24” chain are 18K gold-plated. The cost of the Pendant is listed as $165.00.